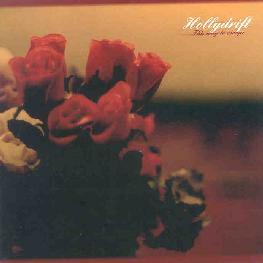 Hollydrift - "This Way To Escape"
Hollydrift is a solo project from Wisconsin based Mathias Anderson. Anderson creates sound collage works that utilize minimalist sound patterns but also incorporate lots of varied sounds, voice samples and melodies. Anderson's collages are indeed just that... there's lots happening with multiple layers of sounds and samples and continually evolving themes. But the result is by no means a disorganized glom. Anderson excels at creating somber but oddball environments that give the listener much to focus on and at all times seems coherent and determined in his path. The disc opens with one of my favorites, "Rest Without Fear", which paints a mechanical factory world that brings to mind Metropolis or a noisier version of the Residents Mark Of The Mole. Machinery sounds and phased industrial wind tunnel waves are combined with somewhat melodic tones to create a sound collage world that is very dark, but more melancholy than eerie or frightening. Dig that ghostly "Rock A Bye Baby"! Tripping through subsequent tracks I was treated to all manner of minimal electronic patterns, voices from the spirit world, church bells, noise textures, loads of strange voice samples from ghostly moaning/chanting to an old Lennon Sisters styled song (that got me chuckling). Another highlight track is "Lean Against The Foe" which consists of strange narrations, the sounds of an auction, acid trip church choirs, and a melody that reminds me of the end theme from some apocalypse flick. "Where Love Begins" is yet another standout that opens with lush symphonics, though the workings of the factory quickly kick in, winding down to a slow idle rumbling that last a few moments until the various drills and saws and conveyor belts fire up. It soon transitions to a strange but peace alien theme and just keeps going from there. While this may sound a bit all over the place, rest assured that Anderson does an impressive job of making his frequent transitions seamless and cohesive. An enjoyable 52 minutes for the discerning sound art fan.